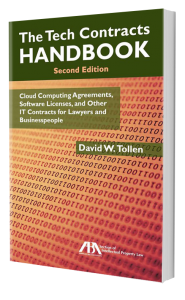 Most IT contract drafters know the difference between a software license agreement and a technology services contract. In a license, the customer gets rights to copy and use software, while in a services contract, the customer gets a service, like tech support or IT consulting. But software as a service (SaaS) seems to throw a wrench into the gears. Which is it? Fortunately, the newish landscape isn’t actually all that confusing (or all that newish). A SaaS agreement is a services contracts, pure and simple. It doesn’t call for a software license. In other words, the customer gets a service in a SaaS deal, not software. The vendor just uses software to provide the service. Maintenance: You don’t need it! In a maintenance clause, the vendor agrees to fix problems with installed software and to send updates and upgrades, so the customer’s copy doesn’t fall behind those of other customers. In a SaaS deal, the customer doesn’t have a copy. The vendor keeps the software and provides it as a service, and that obligation already involves maintaining the software, by definition. (But see below re SLA’s.) Plus, the customer has no copy to fall behind other customers’ copies and so no need for updates and upgrades. When the vendor updates the software on its computers, all customers benefit (in most cases). Of course, your deal may involve both SaaS and installed software. A SaaS vendor may provide its main offering online but also give its customer a software application to install on the customer’s computer — something that helps that computer interact with the online service, for instance. Don’t let that confuse you. What you need there is a software license covering that one installed application, wrapped into the larger services (subscription) contract. The license and its supporting terms should address the installed application only, not the software the vendor keeps on its own computers and uses to run the service. What about 365(n) and SaaS? If you call it a right and not a license, you may lose certain rights if the provider goes bankrupt. So if a SaaS vendor goes bankrupt, the customer is out of luck — unless it’s gotten some kind of SaaS escrow or backup provider. I don’t think there’s any rescue available from 365(n). What would be the big downside of granting both a license and having some sort of service component? Just the fact that there does not need to be upkeep of the software? At first, treating the contract as a subscription made sense, but upon further reflection, I am trying to pin down the true practical benefits of paradigmatically favoring the transaction as services-based versus license-based. Interesting article, but how do you square this with the ruling in MAI Systems Corp. v. Peak Computer, Inc., 991 F.2d 511 (9th Cir. 1993) or the more recent Comedy Central and Warner BRos. v. WTV Systems cases? Don’t some, if not potentially all SaaS services call for loading of part or all of the software into the end-user’s RAM, thereby constituting a copy for purposes of copyright law requiring a license to avoid infringement? And if it’s possible, what’s the harm in including licensing language to be sure the SaaS provider’s IP is protected? Good question, but I don’t think it’s right that many or all SaaS services call for loading software onto the end-user’s computer. In most cases, the customer just views screens produced by the software and sends instructions, without getting a copy. If the customer does get a copy of some software, like something needed to interface with the SaaS system, that should be licensed, as the last paragraph of the post points out. But that doesn’t mean the whole SaaS system calls for a license. I think that for the part not downloaded, the vendor’s better off being quite clear that it’s NOT giving an IP license, or any copies. Does using the word “license” rather than “service”, and generally how the contract language is written, have any effect on the applicability of sales taxes? Given that services generally are not taxed but canned software (licenses) are, would the contractual characterization of the transaction matter? Bob, state sales tax laws vary, so it’s hard to give a universal answer. In general, I suspect there’s a risk you could turn a non-taxable service transaction into a taxable license by mischaracterizing a SaaS subscription as a software license. I’m not a tax expert, though, and I’ve never run into this issue. Any tax lawyers out there?